MINNEAPOLIS (AP) — Paul Millsap left the game to get stitches, then came back in time to help the Denver Nuggets stop the bleeding and get a big win. 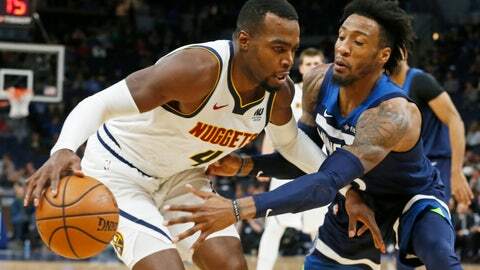 Millsap had 25 points, five rebounds and five steals, Jamal Murray added 18 and the Nuggets had a 35-point third quarter in a 103-101 victory over the Minnesota Timberwolves on Wednesday night. Karl-Anthony Towns led Minnesota with 22 points, and Derrick Rose added 20 off the bench. The Timberwolves outscored Denver in three of the four quarters, but still lost their second straight. The Nuggets, who had lost six of seven after starting the year 9-1, trailed 56-50 at the half. That’s when coach Mike Malone let his team know in no uncertain terms that their effort was not going to cut it. Denver clamped down defensively, holding Minnesota to 5-for-19 shooting and forcing seven turnovers in the third quarter. Meanwhile, Millsap and Murray combined for 23 points, four steals and two blocks as the Nuggets outscored the Wolves 35-18 in the quarter. Millsap started the pivotal third quarter with five points in a quick 7-0 run that put Denver on top 57-56. He then scored on a fast break, connected on a jumper and hit a 3-pointer to push his shooting totals to 10-for-11 on the night. But Millsap’s scoring binge was interrupted when he hit the floor hard in a collision with Towns midway through the third quarter. He went to the locker room holding a towel to his head and received stitches for a facial laceration. Murray picked up where Millsap left off, hitting his second and third 3-pointers of the quarter and dropping in a floater to push Denver’s lead to 80-67. Millsap returned with 7:02 to play in the fourth quarter and played the rest of the way, helping Denver hang on after a 12-0 Minnesota run all but erased its lead. His floater from the baseline gave the Nuggets a 101-95 lead with less than two minutes to play. Minnesota trailed 89-76 early in the fourth quarter when its bench triggered a 12-0 run to make it a game again. Rose hit four free throws and a 3-pointer and Dario Saric added five points in the run. Gary Harris ended Minnesota’s run with a 3-pointer and added two more driving baskets to help Denver maintain its lead. Nikola Jokic and LeBron James are the only two NBA players to lead their teams in points, rebounds, assists and steals. On Wednesday, Jokic showed that he can help his team even on a night when his shots weren’t dropping. He made just 3 of 13 shots from the field and scored seven points, but he also had 12 rebounds and 10 assists. Nuggets: Denver capped a 1-2 road trip with the win. Two of their next three are at home, but then the Nuggets start a five-game road swing on Nov. 30 with games in Portland, Toronto, Orlando, Charlotte and Atlanta. . Millsap made 11 of 13 shots from the field. The rest of the Nuggets were 31-for-76 (40.8 percent). Nuggets: Host Orlando on Friday night. Timberwolves: At Brooklyn on Friday.